I am receiving my magic lessons from Rumpelstiltskin. I suspend a unicorn and he wants me to tear its heart out. I am appalled. I cannot do such a thing to an innocent creature. I tell him this and he tells me I must do it. Rumpel ends up tearing the unicorn’s heart out. I watch it writhe in pain and feel awful. Rumpel explains when you take a heart it holds more power. He hands it to me to crush. I cannot do such a thing. Rumpel does it himself and tells me I need to ask myself what is holding me back. I visit Daniel’s casket. His body remains intact because there is a preservation spell on him. I go to see Rumpel. I finally admit I want to use magic to bring back the dead. He assures me such a thing can be done. Just then a man appears. It is Jefferson who at this time I had not yet met before. I step aside and listen in on their conversation. Jefferson gives Rumpel a crystal ball. In exchange Rumpel desires travel to a land without magic. Jefferson does not understand why anyone would want that. When Rumpel turns his attention back to me he expresses disgust and tells me I am a waste of time. I am alone with Jefferson who tells me there is a man who can bring the dead back. In exchange for introducing me to the ‘wizard,’ as Jefferson calls him, he wants a passport so he can avoid everyone he has wronged. I finally have a spark of hope. Jefferson takes me to meet this wizard. We find him drawing a picture. When we meet he tells me prefers to be called Doctor. I take him along with Jefferson to Daniel’s body. Doctor tests his condition with his blood and tells me that he is an excellent candidate. He then admits that the procedure is experimental. I am disappointed but desperate. He then tells me that he has heard of the powerful hearts in my land..the ones that glow. He wants one. I tell him I know where to get a heart. I bring the men to Cora’s room. I tell them to listen. They hear a heartbeat and ask where it comes from. I take the men to my mother’s vault and explain how wretched she was. I do not even know whose hearts these are but I tell Doctor he may take his pick. There is a storm. I watch the Doctor in a tent with Daniel’s body. Jefferson stays with me. Doctor comes out and tells me he is sorry. The heart was not strong enough. I go inside the tent and put my head on Daniel’s lifeless chest and weep. The next day I find Rumpel with a new student. He tells me she has more promise than I do. I reach inside her chest with ease and take her heart. She looks shocked as I crush it. Rumple is delighted at my change of heart. What I do not know is that I was used by these men. The three men meet in the forest. All Doctor wanted was a heart which Jefferson and Rumpel set up for him. Rumpel banters with the Doctor who believes himself more powerful than Rumpel. Rumpel laughs at such a notion. As the Doctor and Jefferson leave by the magic hat Rumpel reminds the Doctor of the price that comes with magic. The Doctor goes back to his lab where his assistant waits. They use the heart for a different body. The doctor uses electricity from the storm to re-animate a corpse. The assistant commends him and addresses him as Dr. Frankenstein. Doctor Victor Frankenstein is pleased he has re-animated the corpse of his dead brother. He believes he has something much more powerful than magic and that would be science. Mary, Emma, Aurora and Mulan approach a tower. They are shocked when they find dead guards scattered on the ground. At first they believe the ogres to be responsible. Mary immediately recognizes this as the work of Cora. The men are missing their hearts. They hear a voice come from the rubble and find a man. It is Killian Jones. He begs for their help. Emma quietly admits to Mulan she does not understand why Cora would bother leaving a survivor. They ask Killian to explain what happened. He tells them he hid while Cora killed the other men. Emma is not buying his story. The women tie Killian to a tree. Emma insists he is a liar. The women go to leave and Killian calls out to them. 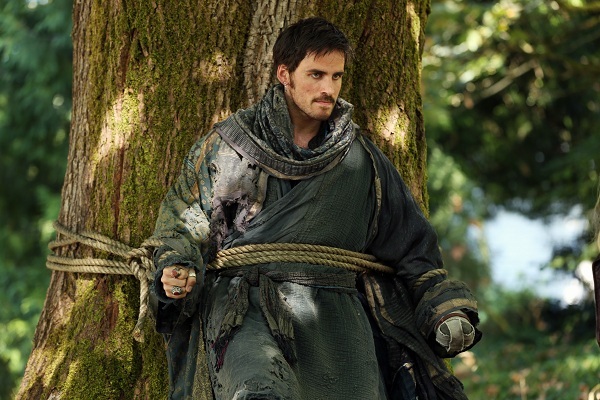 He reveals his identity as Killian Jones also known as Captain Hook. He begins explaining the plot hatched by Cora. He tells them that Cora has dust from the wardrobe and he can help them. Mulan wants to leave him to die but he tells them of a magic compass. He says he can help them find it before Cora does. Emma demands to know what he wants in Storybrooke. He admits he is seeking revenge against Rumpelstiltskin. The women bring Killian whose hands remain tied. They learn that in order to obtain this compass they will need to climb great heights and face a giant. Dr. Whale approaches David who takes the opportunity to punch him. Whale asks why he did that. David admits he is mad Whale slept with his wife. Whale reminds him he was cursed when that happened. They begin to discuss the other land. Whale wants to know if it is true Mary and Emma are there. I visit Archie. I am seeking counseling and I tell him it has been two days since I last used magic. As we continue our session Whale comes in and interrupts. He demands I help him get back to the other land to his dead brother. I tell him I have no way to do that. Archie insists he leave. Whale leaves and Archie asks me if it is true I only brought the living here. I tell him brought who I wanted. I admit to Archie that Daniel’s body is under a preservation spell. I am upset and storm out of the session. I drive through a storm and believe I am going crazy as I see images of Daniel in the rain. David takes Henry to a stable. He has a horse for him but before he may learn to ride he wants him to learn to care for the horse. He tells Henry he is leaving him at the stable and will pick him up later. I go to Daniel’s crypt and he is gone. I am in shock. I search for Whale and find him restrained to a table. I try to find out what happened. He admits he re-animated Daniel but warns me that Daniel is now a monster. At the hospital I am confronted by David about Whale’s attack. I tell him about Whale and Daniel. I then tell him I believe Daniel would head to the stables. David is alarmed and tells me Henry is there. At the stable the horses begin acting up. The door to Henry’s stall opens. His horse runs off and Henry falls. He is approached by Daniel. A confused Daniel begins attacking Henry but David and I arrive to save him. Henry takes off and David wants to destroy Daniel. I plead with David to let me deal with it. David leaves me. I open the stable door. Daniel approaches me and quickly starts to attack. Through his choking me I am able to squeak out ‘I love you.’ He lets go of me and says my name. I hug him so tight. He releases from my embrace and as he backs up I see he is in pain. He begs me to let him go. I plead with him that I cannot live without him. He becomes angry again and goes to attack. This time I use magic to stop him. My heart breaks all over again as I watch his body disintegrate. This time I tell him good-bye. I go to see Archie and admit I have used magic again. Whale leaves the hospital and takes his arm which is on ice to Gold. He wants it reattached. Gold is curious why Whale did something to try and help me. He admits he thought I might help him bring his brother over. Gold will not help him until he says something to him. Gold has something in mind he wants to hear. Whale finally says he needs magic. His arm reappears and Gold triumphantly addresses him as Victor.